At Meadowbrook we understand that family memories are made around the dinner table. Residents, Patients and their families may enjoy family gatherings, holiday meals, and special occasions in our tastefully decorated Private Dining Room which features a large elegant table designed to comfortably seat up to ten people. Private Dining Room reservations should be made with our receptionist. 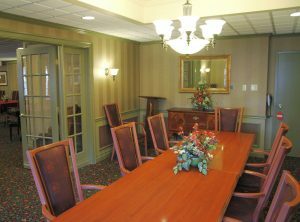 We encourage you to reserve the room well in advance of your event. This room is available for our residents, patients, and their families at no cost.